Overlooking the Tyrrhenian Sea and situated on the edge of the famous "Conca d'Oro", a fertile plain, called with this name since XV century for its lush plantations of citrus orchards, Palermo retains the charm of the people and styles that have taken place there over the centuries: from Punic walls of the villas in Liberty style, through the buildings Arab, Norman and Byzantine, Baroque churches and Neoclassical theatres. The name derives from the Greek, "Pan Ormos," meaning "all port", to indicate its strategic location between the Mediterranean and Europe. 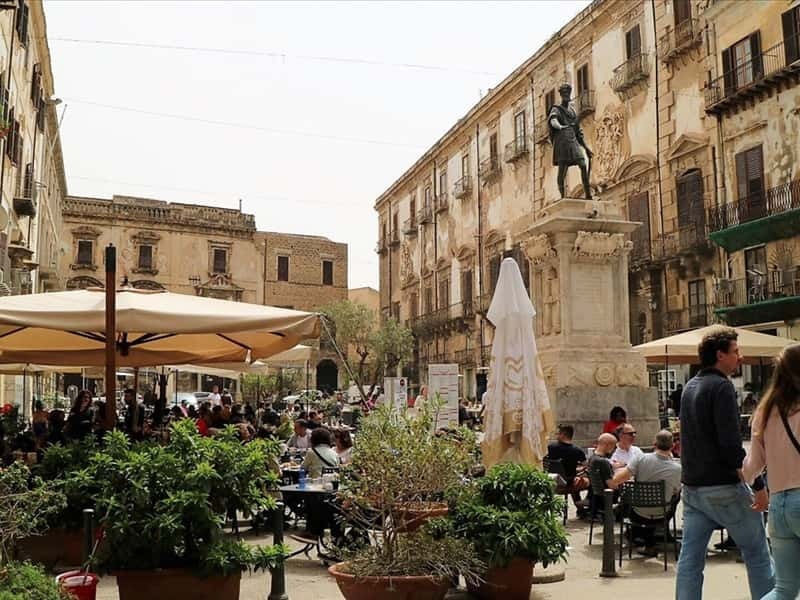 For this reason, since ancient times, Palermo was a land of conquest for Sicani, Cretans, Elimi, Greeks, Phoenicians, Carthaginians, Romans, Byzantines, Arabs, Normans, Suebi, Angevin, of the Aragons and the Spanish. 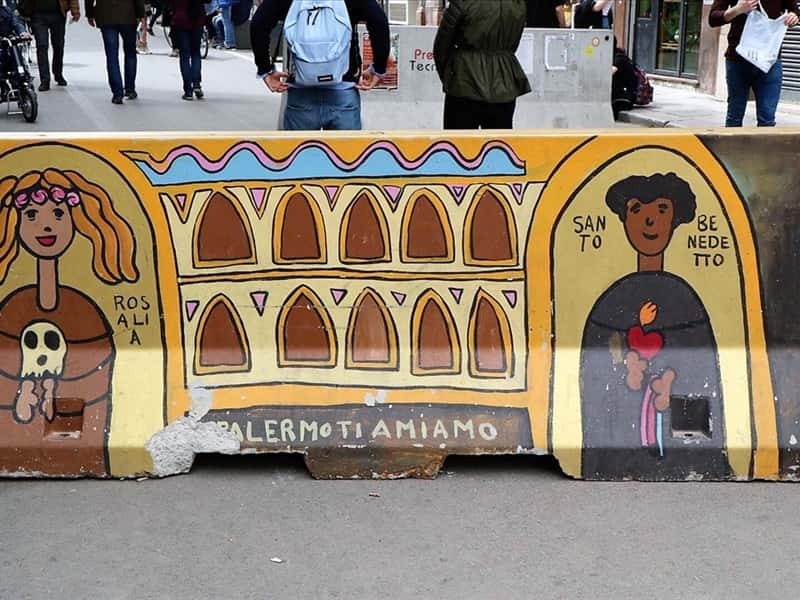 The Golden Age of the city begins in IX century. 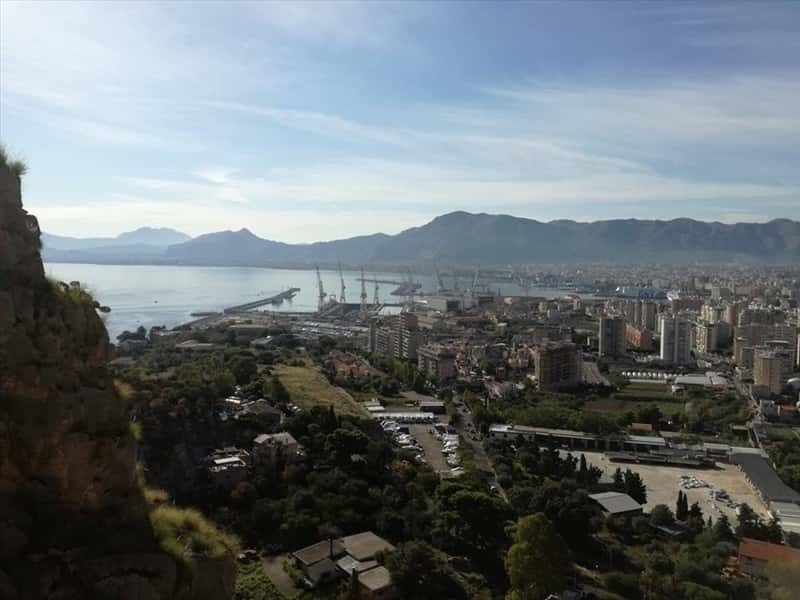 d.C. with the conquest of the whole island by the Arabs, that elected Palermo the capital of the kingdom: in this period the city expanded beyond the boundaries of the old city centre, known as "Cassaro" (from Al Quasr which means the castle), name given in the past to the main street, known today as Corso Vittorio Emanuele). In particular, in the district near the outlet to the sea surrounding the Kalsa (from the Halisah, the chosen one), the fortified residence of the emir. The period of intense artistic and cultural heritage continues with the Norman conquest, which took place in 1071, giving rise to the Arab-Norman style, a wonderful blend of architectural and decorative features. Examples of this period date are the Oriental style gardens with luxurious palaces, like the "Zisa" and the "Cuba". 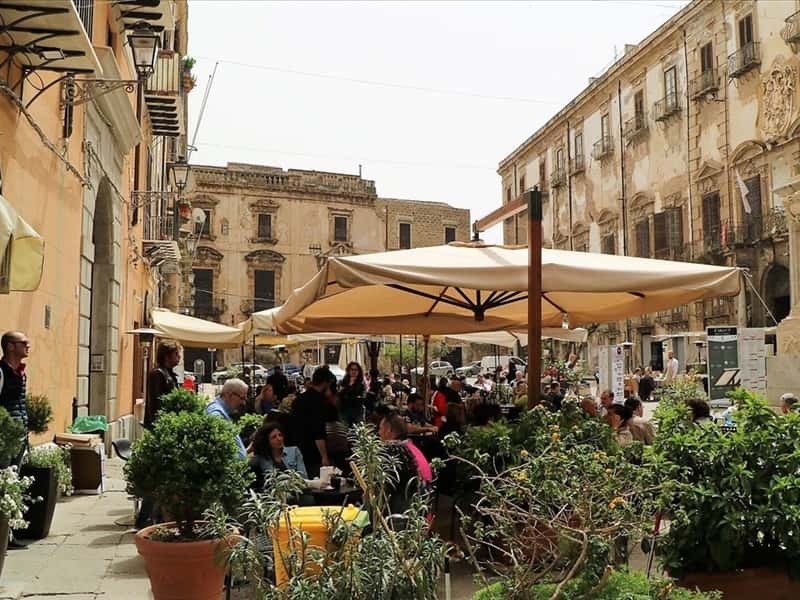 Built in 1184 in the Sicilian-Norman style, the imposing Cathedral stands out among the other buildings of the old town centre for its needle spire, its "bifora" arched windows, its twisted and pointed arches. 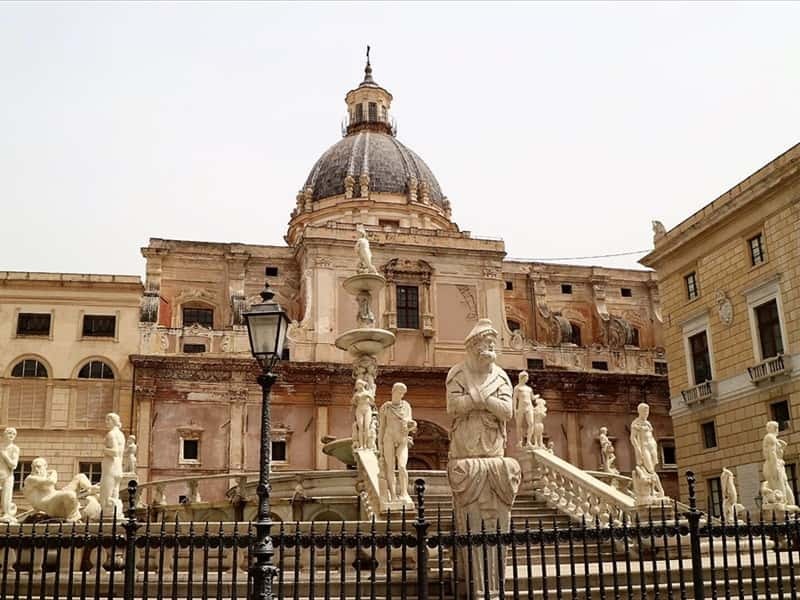 The building maintains its original structure, even though changes has been submitted in the succession of ages, such as the addition in '700 of two aisles and the Baroque dome. 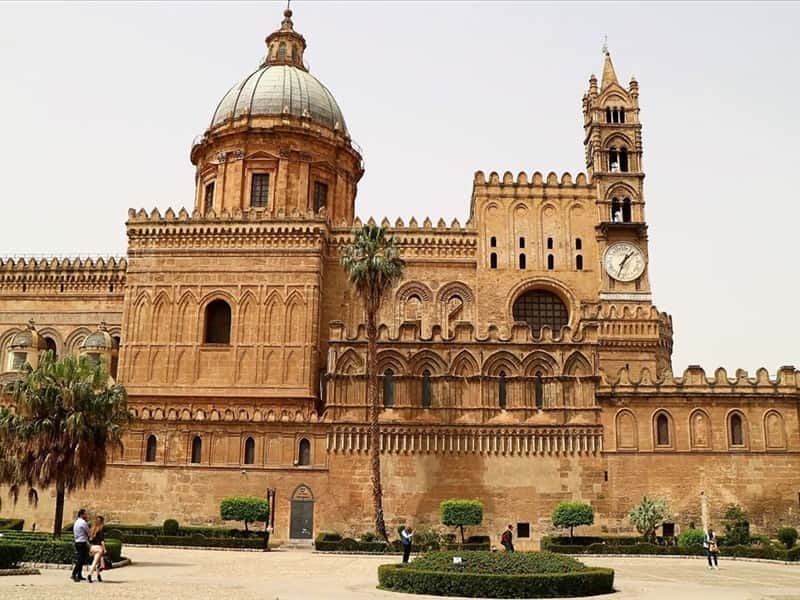 The interior features sculptures of the artist Gagini, the tombs of Henry VI, Frederick II and Constance of Aragon, and also passages from the Koran, inscribed in a column with a silver urn that contains the relics of St. Rosalia patron of Palermo. The Palatine Chapel, built inside the Royal Palace in 1130, the year of coronation of Roger II, assumes a role of absolute importance is, without doubt, the most famous monument of the city, rich of splendid Byzantine mosaics (similar to those found in the Cathedral of Monreale), among which outstands the famous "Cristo Pantocratore benedicente". 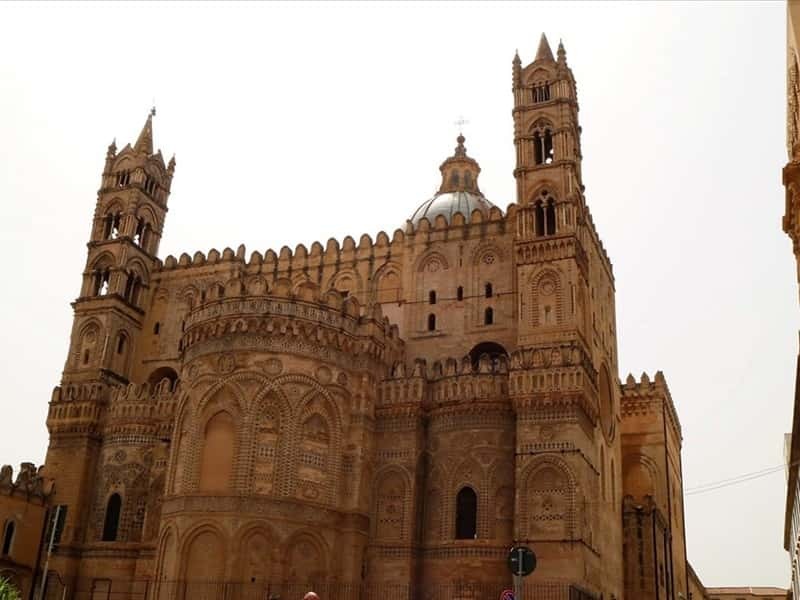 It has a basilica plan with a major nave and two aisles, with pointed arches and columns with composite capitals. The Royal Palace (or Norman), built in IX century on the settlement ruins of the Punic and Roman ages. 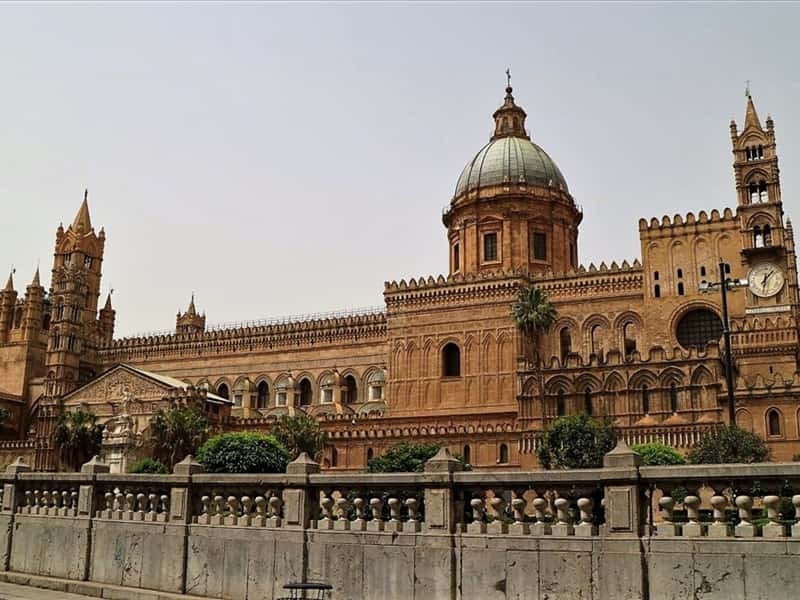 This building has always been the seat of political and administrative power of the city, home of the emirs, kings and the Viceroy and today now houses of the Sicilian Regional Council. The Church and the Cloister of St. John of the Hermits were built by Roger II between 1130 and 1148. The church is famous for its red domes, typical of Arab-Fatima. A small cloister surrounds a small garden that enriches the air with the essences of exotic jasmine 's orange and pomegranate. Zisa Castle (from the "beautiful"), today seat of the Museum of Islamic Art was built during the reign of Wilhelm I as a Summer residence of the king. Transformed into a fortress in XIV century after a period of disuse, it became a deposit for objects contaminated by the plague (XVI sec.). 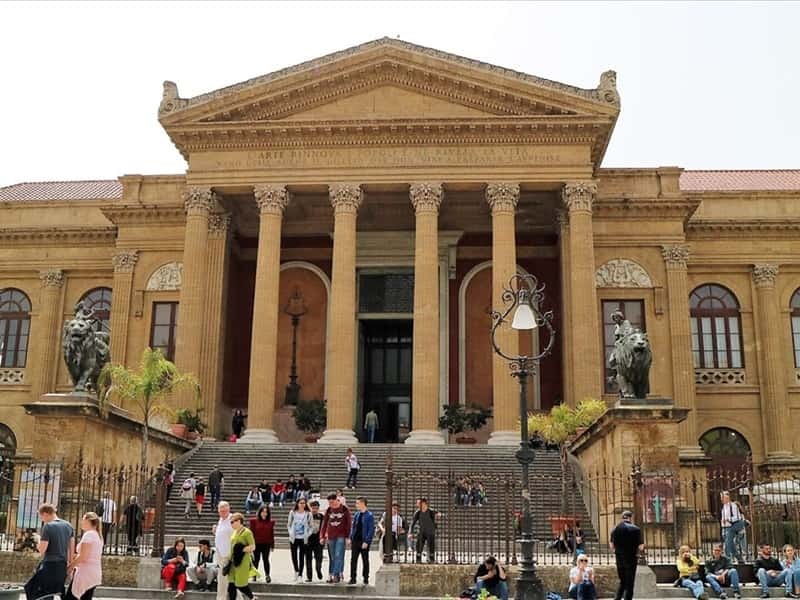 Later it was extensively modified and turned into patrician palace, until the recent renovation when the restorers tried to re-give to the building its original appearance. 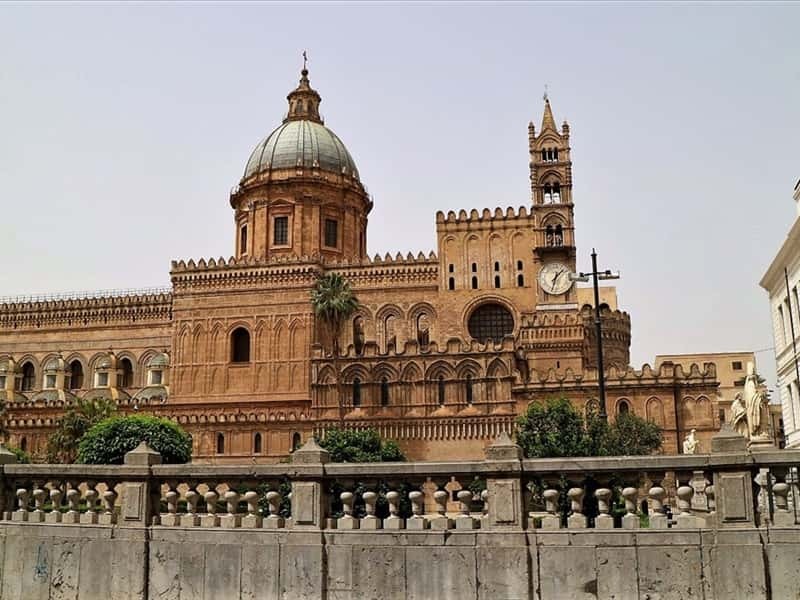 The Cuba was built in 1180 in Arab-Norman style by William II at the center of a large park, the Genoardo, which was part of Sollazzi Regii, a circuit of buildings situated around Palermo. A rectangular shape building, that with its simple decor, features a series of pointed arches of varying width, within which you register other openings. 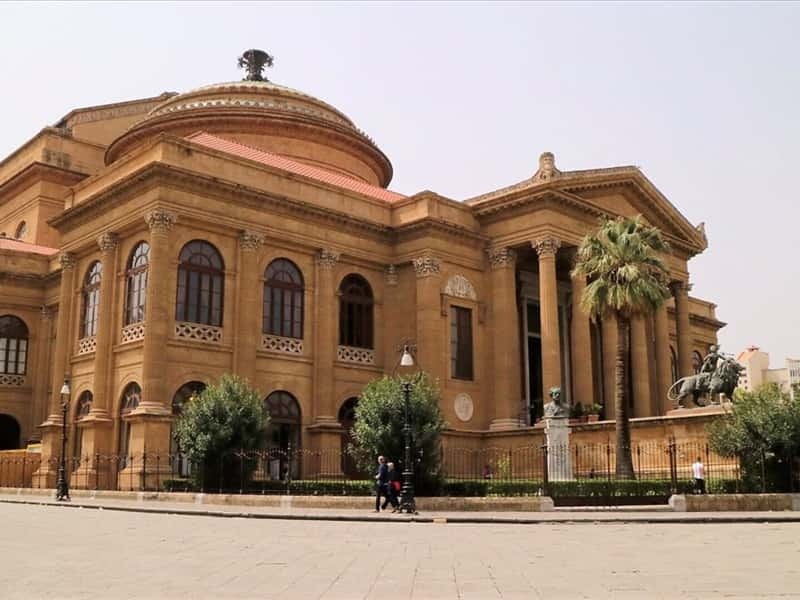 Not to miss: the Teatro Massimo; International Museum of Sicilian Marionettes; Palazzo Abatellis; in Gothic-Catalan, now seat of the Modern and Medieval Art Gallery; Botanical Gardens, founded in 1875 and designed by architects Leon Du Fourny and Venancio Marvuglia; the Church of San Cataldo with its three red domes; the Church of San Domenico, with Rococo elements; Scibene Palace; the Castle of Maredolce; Palazzo Sclafani and Palazzo Chiaramonte. This town web page has been visited 86,588 times.